In the trend, people are getting more misperception on dealing accounts such as inventory, accounts payable, general ledgers, GST consultants functionalities etc. To know the amount transactions of invoices, purchase receipts, payroll and many. So the ultimate destination ends with a valuable E-billing Software hence we have developed our latest Accounting Software to ensure the transaction commitments. 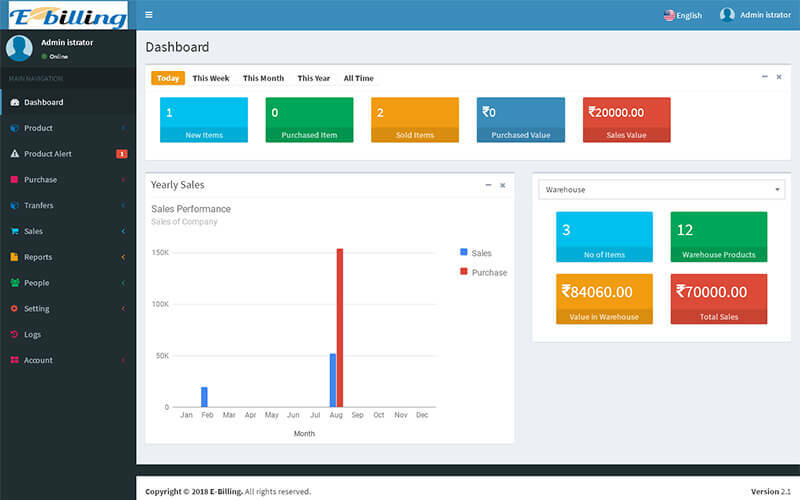 Our GST Implemented Accounting Software dashboard comes with readymade features like sale order quotation, purchases, bank transfer and taxation, currency values, mode of payments, GST returns, expenses calculation, detailed purchase reports and more relates to accountants. Through the enthusiastic developers, we have introduced our latest VAT Accounting Software to the entrepreneurs to manage the income report produced in the expenses made with dealing bank accounts. You are eligible to handle the customer CSV file and user account. A to Z controlling of reports such as past sales report, reports of the team, expense/income report, stocks on hand reports etc. from this strategy your accounting business will never let you down when we have our VAT(Value Added Tax) software with exciting features. Attractive setting panels are the additional magnetism to the script, under this setting panel you will find settings that manage Finance, Company settings,and typical general settings. We have minimizes the tedious control process to make the website as user-friendly with many shortcut features that are highly helpful to setup the accounting software with fingertips ready. The ultimate endpoint for managing customers, products and services, bank amount transactions, sales and much more. Take part in with our highly customizable Accounting Software to start a professional business with little investments. Ebilling Software is highly helpful for me since you can utilize this script for various reasons like GST consultants, VAT Accounting etc. Powerful script and excellent support from you guys thanks a lot.